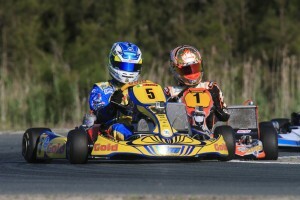 Five-time World Karting Champion, Davide Forè is looking to take a third Race of Stars surfboard back to Italy after October 13-15’s event at the Xtreme Karting Complex at Pimpama on the Gold Coast. The Italian icon had to settle for third place last year after a thrilling fight with current World Champion, CRG’s Paolo de Conto, Ricciardo Kart racer Marijn Kremers and his Gold Kart team-mate, Tomas Gasperak. His haul from the Gold Coast event has been strong – winning two of the premier KZ2 gearbox surfboards. Forè’s second win came after he emerged on top of a high speed duel with Sunshine Coast’s Kyle Ensbey in 2015 – the duo millimetres apart at 160kph heading into turn one. Forè is looking to walk away as the best of the best in the Southern Hemisphere’s biggest karting event – in a field that includes de Conto – fresh from winning his second World Championship, Kremers and Australia’s best – including Brad Jones Racing Supercars driver, Nick Percat. “The Race of Stars has become a highlight for me,” said Forè. “The weather is amazing on the Gold Coast and to race against some of the best in Australia and the world on a circuit like the Xtreme Karting Complex is really exciting. Turn one is unlike most corners in world karting and takes huge commitment, along with being flat out for nearly 75% of the lap. Forè – who’s become a crowd favourite at the Gold Coast event – will compete alongside of 15-year old Tomas Gasperak with support from My Toy Collection, NASCAR Racing Australia and the Gasperak family. Gasperak – who was fourth last year – will return home from the United States where he is working his way through the NASCAR racing ladder. “Davide is one of karting’s greats and I can’t wait to link up with him again,” said the youngster. “I’ve learned so much from being around him and his results around the world and especially here at the Race of Stars show what a professional he is. The Race of Stars on the Gold Coast will see more than 200 of Australia and the world’s best kart drivers compete on the Xtreme Karting complex. Entry is free to the public over the weekend of October 13-15. The Race of Stars is a key lead-up event to the Vodafone Gold Coast 600 Supercars event.